Abundant sunshine. Rolling, grass-covered, bald summits. Wildflowers and wild blueberries by the millions, and nearly endless views from the trail. 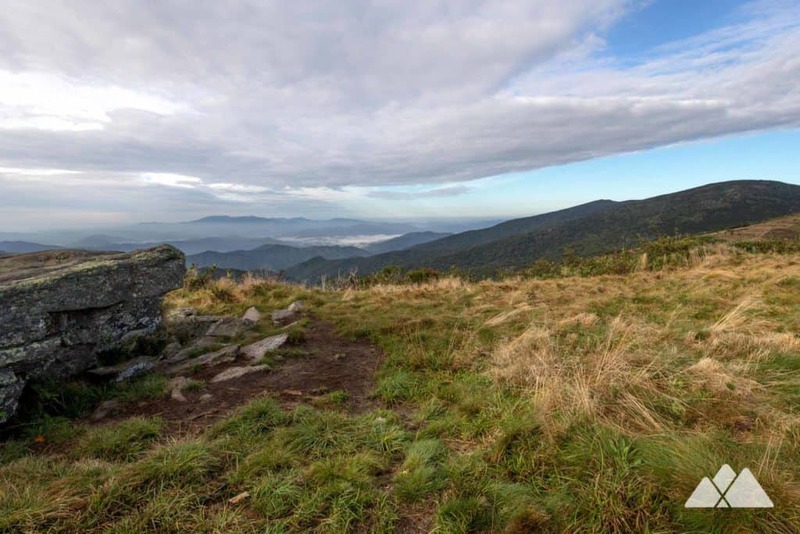 Few places on the Appalachian Trail’s southern stretch rival the beauty of Roan Mountain. 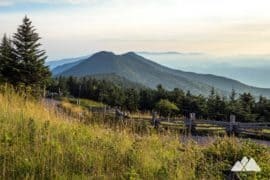 This hike from Carvers Gap to Grassy Ridge Bald is one of our all-time favorites on the Appalachian Trail in North Carolina. 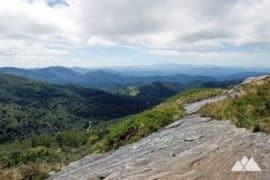 Rolling elevation over three mountain balds, the trail catches ample sunlight, endless views, and near-constant breezes. Golden grasses and abundant wildflowers stretch far and wide. Sparse, wind-blown trees cling to rolling ridgeline. 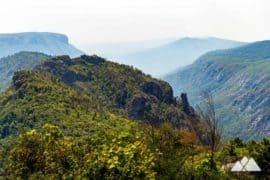 It’s one of those amazing hikes that starts with incredible views from the trailhead, and the views just keep getting better throughout the hike. 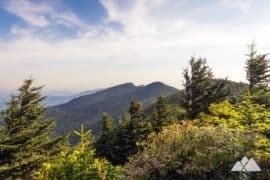 And the hike’s final destination, Grassy Ridge, is a sun-drenched, grassy summit that tops out at over 6100 feet, offering extraordinary views and some great near-summit campsites. 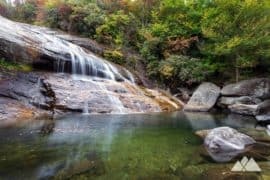 The mountain is a fantastic four-season hiking destination. 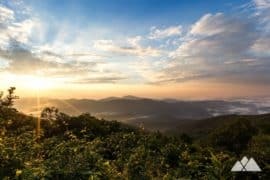 While we’re huge fans of Roan’s wildflower-filled summers and vibrant leaf color in autumn, the mountain is equally adventure-worthy for a frosty sunrise winter hike, too. 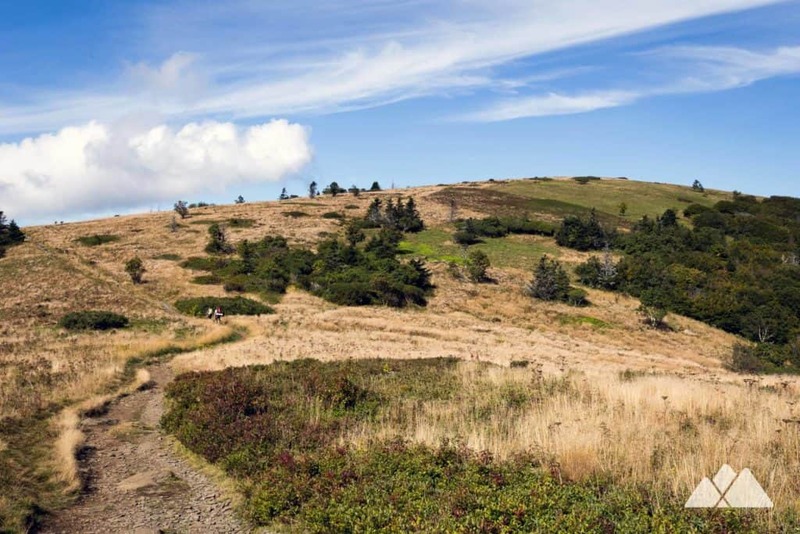 We’ve developed a bit of an addiction to Roan Mountain’s beauty. 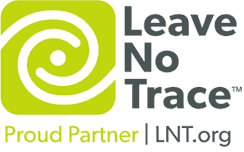 You likely will too. 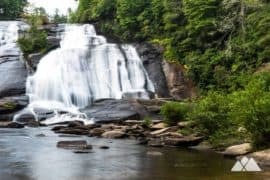 Hike it in winter, spring, summer, and fall. Hike it at sunrise, mid-day, and sunset. 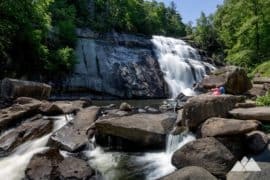 Hike it again and again: this stretch of the Appalachian Trail seems to get even better every time. 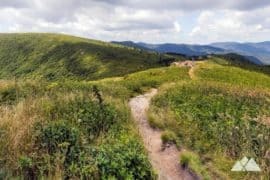 The hike begins at the Carvers Gap trailhead (view maps and driving directions), crossing the paved highway to hike the AT eastbound into rolling grasslands. The AT arcs to the north, following a well-maintained gravel trail and climbing elevation through rhododendron. 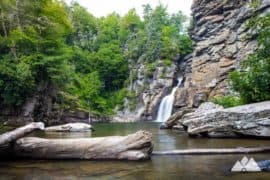 The hike enters a shady, dense grove of balsam fir, the air scented with the sweet scent of evergreen, moss, and earth. The trail meanders through the fir forest, continuing its steady elevation climb. 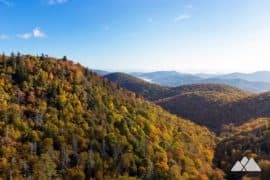 The hike exits the forest canopy at .3 mile, entering the grassy landscape of Round Bald. 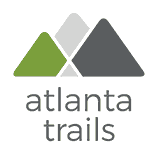 The trail crests Round Bald at .6 mile, catching exceptional views across the mountain’s golden grasses and colorful wildflowers. 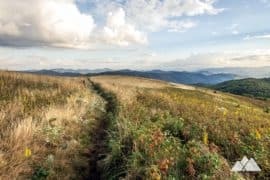 And while the views from Round Bald are stunning, they only get better, as the trail continues eastbound and descends into Engine Gap. Wild blueberry bushes cover the gap in warm-weather months, prolific in the abundant sunshine. 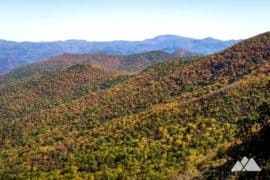 Sparse clumps of trees pepper the summits and gaps in the Roan Highlands, but the views from the trail are otherwise open and plentiful. The trail begins a second climb, trekking through a rocky landscape before reaching the Jane Bald summit. Large, slab rock outcrops near the summit offer exceptional views and a perfect place to soak up some sun. 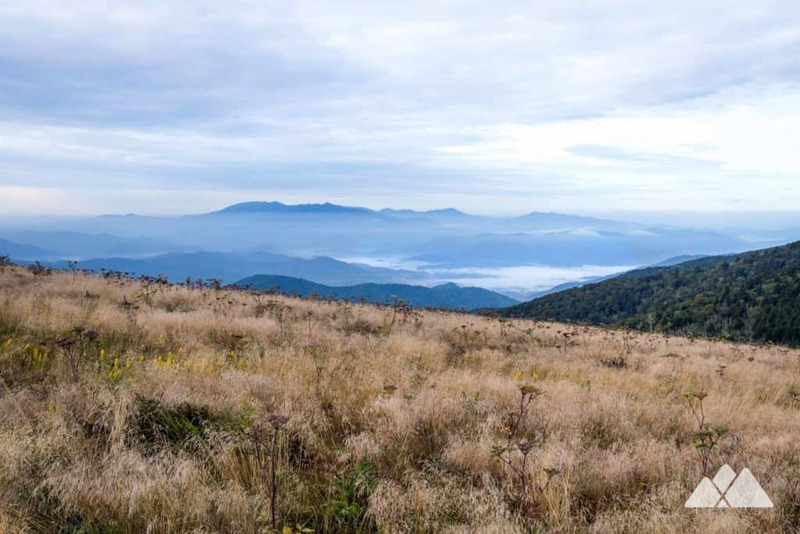 Grassy Ridge Bald lies to the east, rising dramatically in the near distance. 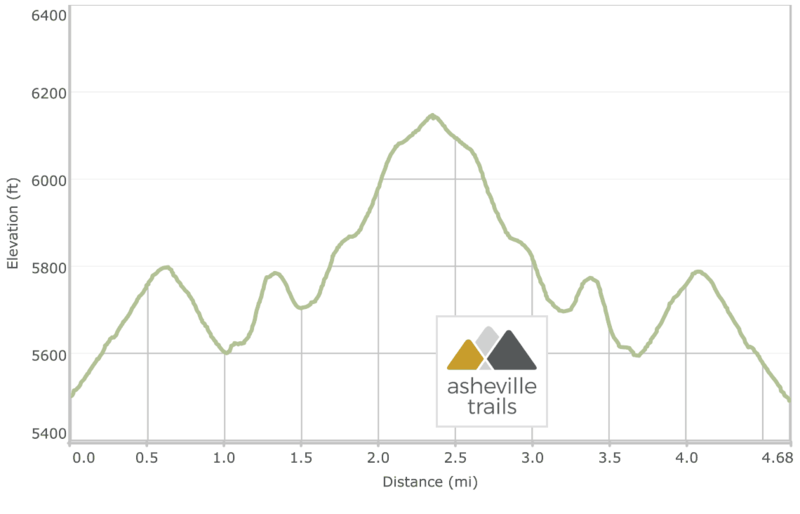 The AT descends into a gap, rolling elevation through the saddle before beginning a long, extended climb to the Grassy Ridge summit. 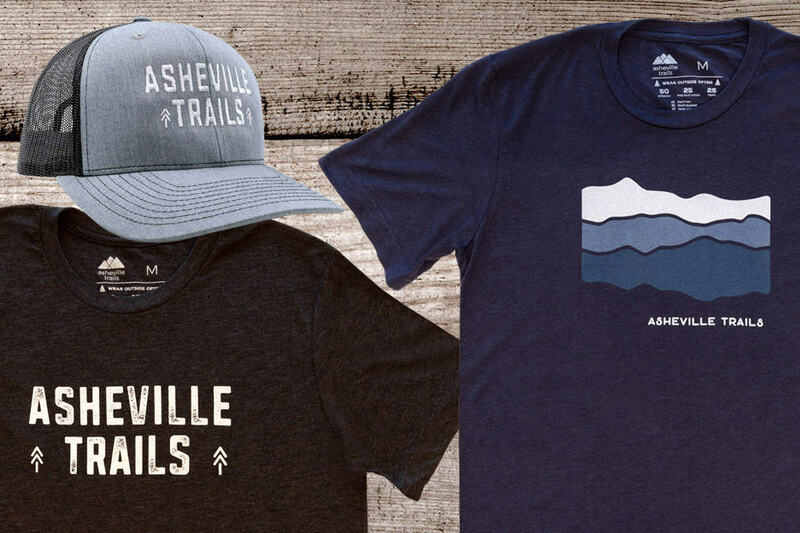 The trail climbs over 400 feet from the gap to the summit, the longest and steepest climb on this adventure. 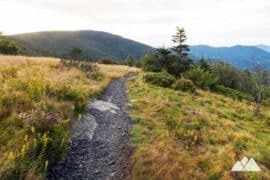 The trail reaches an intersection at 1.8 miles; from here, the Appalachian Trail leads to the Overmountain Shelter, a historic red barn, at Yellow Mountain Gap. 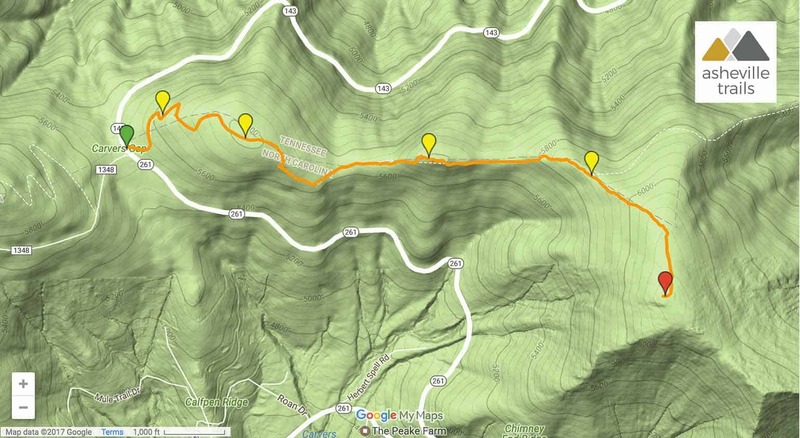 This route veers southeast on a side spur to summit Grassy Ridge Bald. 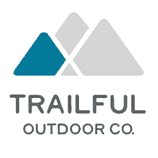 The trail narrows, navigating through head-high brush and diving through a tunnel of dense rhododendron. The trail nears the summit, and breaks into the open sunshine at 2.15 miles. Expansive views unfold in every direction. At the summit, several large, angular rock outcrops host a plaque that’s dedicated to Cornelious Rex Peake. 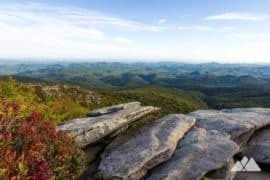 The elongated ridge of Grandfather Mountain sits prominently on the eastern horizon, and Mount Mitchell can be seen to the south. The views are plentiful and simply beautiful. 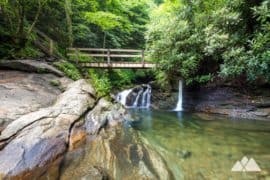 After soaking up the sublime views, this hike departs the bald, following the outbound route on the spur trail and the AT in reverse. 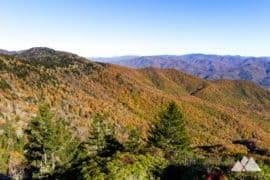 The views are equally exceptional on the return hike as the trail rolls over Jane Bald and Round Bald. 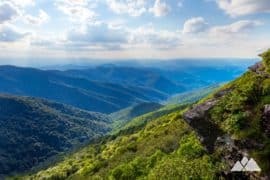 The hike reaches the Carvers Gap trailhead at 4.7 miles, completing this view-packed adventure. Up for some more mileage? 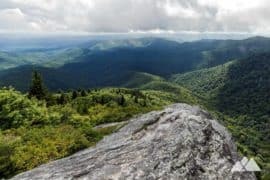 Hiking west from Carvers Gap, the Appalachian Trail climbs to Roan High Knob, trailing through a mossy, fern-filled forest under the canopy of sweet-scented balsam fir. 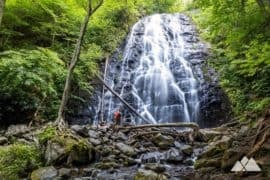 It’s a 4.5-mile round trip, and highly worthwhile: the landscape is lush and shady, a complete contrast to the eastbound hike through the Highlands. 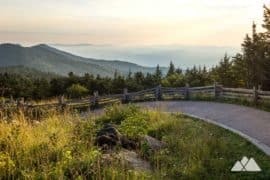 Or, from the spur trail at Grassy Ridge Bald, continue following the Appalachian Trail eastbound to beautiful views at the Overmountain Shelter, a historic red barn, at Yellow Mountain Gap. 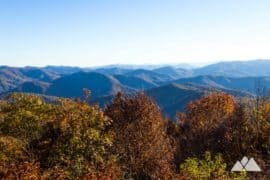 Free parking is available at the Carvers Gap trailhead.